Stigma into four loosely defined groups: physical, social, verbal and institutional. Labeling: in Africa: "moving skeleton," "walking corpse," and "keys to the mortuary." In Vietnam: "social evils," and "scum of society." The basic initiation of District authority is to issues of Infringements or disturbances with respect to stigma & discrimination in accessing and utilizing the rights, services, provisions and benefits available for PLHIVs have been tackled by DAPCU. Creating awareness in all the related services which are closely related to the PLHIV like Health Services from Government as well as the Private services. DAPCU received the complaint about the Stigma and Discrimination first of all we discuss with the together and after that the take next stapes. Amravati district is situated in middle of vidarbha and adjoining to MP border. Anjangaon Bari is the village which is 15 K.M. away from Amravati city .The population of Anjangaon Bari is 15000 where PHC is working from last 5-6 years and recently converted into 24*7 PHC, 4 General practitioners including homeopath and RMP are working there. Most of the patients and maximum ANC has approach to Amravati for health problem. Jeevean Vikas Sanstha is a NGO which is situated at Paratwada of Amravati district and its Navjeevan Care Center is at Nimbhora which is near to Amravati and orphan center for CLHA is run by the NGO. That center has 21 CLHA for care and education. Eight CLHA boys are linked to Z.P. Marathi primary boy’s school; four CLHA girls are linked to Marathi girl’s school in Anjangaon Bari in this year, remaining is linked to Janata High school in Anjangeon Bari from last two year. The status of the children has disclosed to school teacher for precautionary major, in case the child get injury or get sick in school then school authority would have to contact to care center so the center will take care as early as possible. On the occasion of Youth day DAPCU and Civil Hospital organized the rally in the morning, RTM SAP MANDAL; Amravati is running a PPTCT project with the help of MSACS also organized the Youth Melava at Mozari D.Ed. Collage. On 12th August 2009 when we had completed the rally and were on way (My self and Dr.Raghunathraoji Wadekar RTMSAP Mandal) to address the youth melawa. The PPTCT ex peers who is now working with CHAHA project has given the message at 12.30 PM that in Anjangeon Bari all parents of Z.P.primary school going children is gathered together to protest against school authority that their children will not attend the school if the CLHA are in school, because our children said us that in our school there are AIDS infected children so possibility of infection to us. We (Ajay Sakhare and Dr.Raghunath Wadekar) finished the Youth melawa and proceed for the Navajeevan Care Center. After getting visit to Care Center’s Program Manager Anthony we got all information which has given above, then we both gone to that village to contact the Sarpanch of that village but she was out of station so unable to meet. After visiting some villagers we came back to Amravati. All details share with the Dr. C. L. Sonkusare Sir Civil Surgeon Amravati. 13th August, I shared and briefing to the Shri Ramesh Deokar Sir (IAS) Project Director MSACS Mumbai, Dr.Basant Bagadi Sir, Addl. Project Director MSACS, Dr. Tayade madam, Joint Director MSACS, after given permission by PD Sir, attend the Meeting conduct by Block Development Officer at Panchayat Samiti office with the education authority, School Head Mistress and the reprehensive of NGO. After meeting all member decided to Visit the Village. School and health authority with all NGO working on HIV/AIDS has visited to Anjangeon Bari and take meeting with school teacher and some parents who were present in the village. There were lot of confusion and myths and misconception of villagers about HIV/AIDS. After getting answer of their question they were satisfied and come on conclusion that on 15th August evening all villagers with parents will come together and the NGO authority, health and education authority will sensitize to villagers. Hope that sensitization meets converts in positive attitude. Dr.Shri Basant Bagadi Sir Addl. 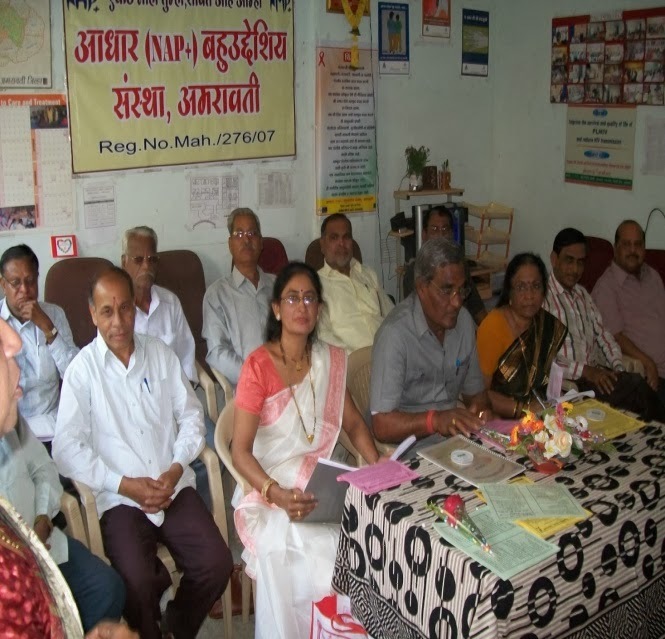 Project Director MSACS visited Amravati on 14th August 09 in relation to discrimination of CLHA in to Z.P. Boys School & Z.P. Girls School Anjangaon Bari Dist. Amrvati. We visited on way to Community Care Center and orphan hostel at Nimbhora 7 Kms. from Amravati. There we discussed with Project Coordinator and Medical Officer about the problem of Anjangaon Bari School. There after we visited the school at Anjangaon Bari discussed the issue along with Head Mistress and Teachers and then after conducted group meeting to sensitize then regarding HIV dynamics. We also discussed the issue with Sarpanch Smt. Kamaltai Tayade and Upsarpanch Shri Tingane and about 15 to 20 villagers and got positive response from there side. Then we visited the Janata High School in which 8 infected students have already been studying when there was no issue of discrimination. APD congratulate the Principle and the staff of the school for good harmony where by other students were taking keen interest in well being of HIV positive students. Lastly we visited Anjangaon PHC and gave necessary directions to laboratory technician for immediately for starting of F.I. ICTC which is 24*7 PHC where the LT is trained in HIV testing. Then we came back to Amravati and meet Block Development Officer, District Health Officer and District Civil Surgeon regarding the issue of Anjangaon Bari. During the meeting with DHO and PPTCT NGO secretary Dr.Raghunath Wadekar we discussed abut the ICTCs in 24*7 PHC of Amravati District. Dr Bagadi sir tried to meet Chief Executive Officer Shri Omprakash Bakuriya. After Dr. Bagadi’s departure I again went to CEO and had given the brief to CEO regarding the issue of Anjangaon Bari. As per the instruction of Dr. Bagadi APD I meet following officers. 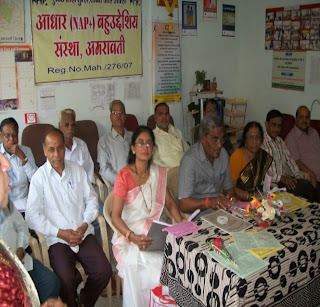 The meeting all 4 NGO working in Amravati along with CS, DHO, BDO, & BEO was held on 15/8/09. On the planning of 13th August meting the sensitization programmed organized by all the NGO working on HIV/AIDS at Z.P. School Anjangaon Bari. At the time of programmed near about 1000 and more villagers are attend the programmed. Firstly the songs “Hatse Hat Milao” and other songs will play on screen. After that the Mr. Ajay Kulathe Jivan Vikas Sanstha delivered the presentation in Marathi language on LCD. Then Dr. Raghunath Wadekar RTMSAP Mandal Mozari interacts with the villagers and touch to the issue. Mr. Vijay Dange NAP+ (positive speaker) also interacts with villagers. In the session of question and Answer Dr. Shri C.L. Sonkusare Sir, Dr.Shri K.S. Rathod sir, Shri Nikas District Education officer, Dr. Babita Vargia MO Community Care Center, Shri R.M.Bhuyar BDO, Dr. Raghunath Wadekar RTMSAP, Smt Kamaltai Tayade Sarpanh, Dr. Hutake MO PHC Anjangaon Bari, Shri Vilas Tayade NAP+ Aadhar and I answer to villagers’ question. Conclusion of meeting: - The response is positive and the main thing is that the woman’s and majority of youth in side of CLHA. But few villager against the CLHA and they could not understand so close the meeting. After discussion with CS, DHO, EO, BDO, NGO representative, Sarpanch trap those people and one to one counseling to them. And next strategy decided after meeting with Collector madam and CEO Sir. In that time we take decision the all CLHA students attend the school from 17th August 2009. Success story of Mainstreaming with General Population. 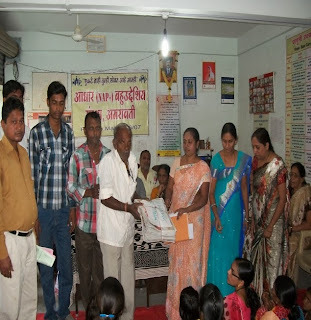  The DAPCU Amravati introduces the DLN to well known social worker of Amravati District Dr. Govind Kasat. Dr. Govind Kasat attends the get-together, peer convention and other events of DLN and discusses with the PLHIV assessments of their needs. Dr. Govind Kasat discuss with me about needs of PLHIV. Then he decided to collect the donation from different donor (Specialty of Dr. Kasat if he donate 5000 Rs. to any needy person he collect this amount from 50 person not from single donor, Another specialty is he generate the funds from Raddi (news paper) collect from home to home and generate the funds).  Then we discuss with Mrs. Tayade president of DLN and discuss about their need she said they need sewing machines and 1 Bicycle for CLHIV. Dr. Kasat collects the donation from donor and date fix by DPO, DLN president and Dr. Govind Kasat, also fix the guest of the programme.  The DLN take whole responsibility to organize the programmed. The near about all the guest are attend the programme.  The all donor attend the programme.  Programme start on time.  At the tea time the all delegates take the food made by the DLN member without any hesitation. It is our main motto to mainstreaming of the white color people of the society to mix with the PLHIV. Labels: Amravati, Maharashtra, Thematic interaction: Stigma & Discrimination and DAPCU.